Make A Splash With Your Group Event! Magic Springs Theme and Water Park has great rates for groups. You play, we’ll plan — let us take care of the details so you can have the fun! Bring your whole staff to the park. It's a great way to reward their hard work, celebrate company achievements, and motivate your entire team. Also, your company might be eligible to offer Magic Springs ticket discounts to its employees. Make lifetime memories when you plan your next group trip to Magic Springs Theme and Water Park, guaranteed! As Arkansas’s biggest theme and water park in one your group gets two parks for one low price and giving them an experience that they will never forget. Besides offering the BEST discount to Education & Youth Groups of 15 or more Magic Springs host three private education events each May. Education in Motion days allow teachers to take learning outside the classroom while making learning FUN! Bring your group together in a unique, fun and exceptional way. 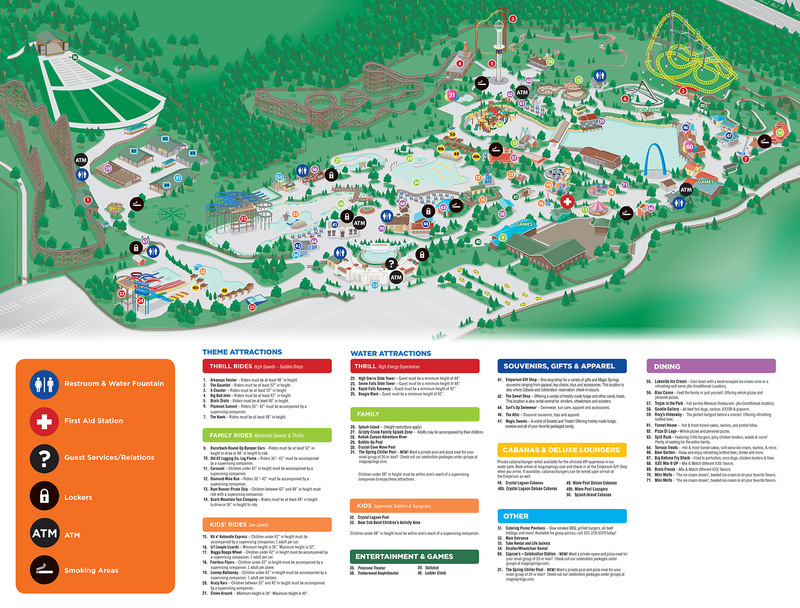 Magic Springs Theme & Water Park is the perfect place to hold your next company picnic, family reunion, church social or customer appreciation event. Packages include admission, a delicious catered meal severed in one of our four private pavilions all for less than the cost of a regular admission ticket. Having a catered outing at Magic Springs is fun, easy to plan and most importantly affordable. Simply pick a date, menu and meal time then let our professional events team handle all the rest. We work while you play! 25% non-refundable deposit is required for a catered event. The deposit will be deducted from the admission portion of your invoice. All prices subject to AR State, Garland County and Hot Springs City sales tax. Would you like to offer your employees a cost free benefit? Sign your Company up for our Consignment Ticket program and offer either tickets you sell in your office at a discounted rate or our hassle-free Online ticket purchasing option. Tickets are valid any day of the regular operating season. Please call our Group Event Planners at 501.318.5370 or email us at sales@magicsprings.com for more details. Magic Springs Theme and Water Park is the perfect outing for any group. From bands, sports teams, scout troops, church’s, daycares or family reunions. Magic Springs is the perfect destination for your next group adventure! Between our thrilling rides, fantastic water slides and spectacular shows, there's something exciting for people of all ages and groups of all sizes. There's no waiting in long lines at the ticket booths when you prepay for admission tickets. We'll mail them to you, you distribute them to your group and entry's a breeze. With the convenience of in-park meal vouchers your group will feel like VIP’s. From personalized tickets with your group name on them to assistance with communicating to your group, we'll do our best to make your group feel welcome. Buses and 15 passenger vans or larger park for Free! Groups of 15 or more can save $8 per ticket by ordering online now! Tickets valid for one visit weekends April 6 thru May 5. PLUS 1 Complimentary Ticket For Every 15 Purchased! Groups of 15 or more can save up to 50% by ordering online now! Tickets valid for one visit any operating day April 6 thru November 3. Tickets valid for one visit weekends September 28 thru November 3. MAIL/PHONE: Advanced Ticket orders must be received at least 7 business days in advance. Call (501) 318-5370 to order by phone (Monday - Friday from 9 a.m. - 5 p.m. CST). All orders received less than 10 business days prior to your visit will be held for pick-up at the Will Call window at the park's main gate. To receive tax exemption, a current state tax exemption certificate must be included with your order. By state law, we cannot process tax-exempt ticket orders until a tax-exempt certificate has been received. According to Arkansas State Tax Laws, Schools and Churches are not considered to be tax exempt institutions for purchases at Magic Springs. Checks and credit cards are accepted for mail orders; credit and debit cards are accepted for phone orders. We accept Visa, MasterCard, AMEX and Discover. Please Note: tickets are non-refundable. Prices and operating schedules are subject to change without notice. Pre-ordered Group tickets can be used any regular operating day during the 2019 season. Shipping/processing fees apply to group orders that wish to have their tickets in advance. We cannot ship to P.O. Boxes. Additional tickets may be purchased at Guest Relations on the day of your visit for the prepaid price (present original receipt and/or Booking Confirmation). Parking for buses, 15 passenger vans or larger and charter buses is FREE. Cars are $15 per vehicle. Complimentary admission is provided to your bus driver with a CDL on the day of your visit. PURCHASING AT THE PARK: Group tickets can be bought at the park on the day of your visit for groups of 15 or more people at the "Walk-Up" group rate of $34.99 + tax per person. Complimentary ticket offer is not available for "Walk-Up" purchases. NOTE: NO WALK-UP GROUP RATES AVAILABLE FOR EARLY BIRD (April 6-May 5) or MAGIC SCREAMS (SEPTEMBER 28 -NOVEMBER 3). Bring your group together in a unique, fun and exceptional way. Magic Springs has the ideal facilities for groups of 15 to 1,500 or even more. Imagine hosting a catered picnic, a private "Sectional" event like a Luau in our Wave Pool area or the ultimate magical experience of an ultra-exclusive Park Buyout. From set-up to clean-up, we handle all the details. Exclusive catered events take place in our beautifully landscaped private picnic event area with ample seating under four separate pavilions. Pavilion #1 & Pavilion #3 can accommodate up to 350 people each with 2,400 square feet. Pavilion #2 & Pavilion #4 can accommodate up to 700 people each with 4,800 square feet. The entire area can accommodate over 2,100 guests at any one-time. Our beautifully landscaped Timberwood Amphitheater is one of Arkansas’s premier outdoor concert venues having hosted such artists as Lynyrd Skynyrd, Martina McBride, Blue Oyster Cult and Skillet. With fixed seating for 750 and festival seating for upwards of 5,000 Timberwood Amphitheater offers a unique alternative for rally’s, worship service or concerts. At Magic Springs we can do anything a hotel or meeting facility can – but they can’t offer what we can. We have atmosphere, ambiance, natural theming, rides, games, tasty food and a rich history of 40 years as Arkansas’s ONLY Theme & Water Park. A unique, fun and only one-of-its kind venue. The classic wooden roller coaster, The Arkansas Twister continues to be one of Magic Springs most popular thrill ride. At over 13 stories, Brain Drain offers breathtaking view of the city and the beautiful panorama of our Ouachita Mountains. Arkansas’s ONLY Theme & Water Park. Nestled in the shadows of Hot Springs National Park and adjacent to historic Hot Springs, Arkansas! Pulled Pork Nachos - Our slow smoked pulled pork, layered over house-made chips, topped with nacho cheese, smoky BBQ sauce and jalapeno slices. Meatball Sliders - Classic Italian meatballs, smothered in fresh tomato sauce then topped with our signature avocado mango salsa. Loaded Twice Baked Potato Boats - Halved Idaho baked potatoes stuffed with all those yummy fix'ins such as butter, sour cream, shredded cheese, bacon bits and green onions. Antipasto Skewers - Cured meats, fresh cheeses, tangy olives, assorted fresh peppers and herbs that are light but satisfying. Fruit & Yogurt Parfait - Layers of delicious strawberry yogurt, followed by fresh fruit, then vanilla yogurt all topped with crunchy granola. Group Sales at 501-318-5370 or at Info@MagicSprings.com. We would love the opportunity to work with you and host an Experience you will never forget!